A gorgeous addition to a wedding gown, the long train can, however, put a damper on spirited activity such as dancing at the wedding reception. A seamstress will lift the long train and attach it to the back of the gown with a cloth-covered button and loop to give the bride more freedom of movement. This is known as a bustle. There are several different types of bustles, but the easiest is one button and loop. With this method, you can still see the intricacies of the train. The bustle is usually not included in the cost of the wedding dress; it is one of the alterations done after the gown is purchased. You can save money by doing it yourself. 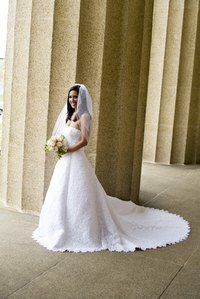 Put the wedding dress on the bride-to-be or a dress form that is the same height she is. Find the middle back on the waist of the dress and mark the spot with a straight pin. Pinch a small spot of fabric about halfway down the train; lift it up to the straight pin, and adjust the train so the hem falls the way you want it to. It may take several tries to determine exactly the spot on the train to use to get the drape and length right. Once you find the spot on the train, mark the location with a straight pin. Sew a covered button where the straight pin is on the waist of the dress. Sew one loop of matching ribbon about 1 inch in length in the spot where the straight pin is on the train. Put the dress on the bride-to-be and, grasping the loop of ribbon, bring it up and attach it to the button on the dress. Check to be certain the train is falling where you want it.